German Christian Old Testament scholar; born Sept. 26, 1679, in Dresden; died April 27, 1767, at Lübeck; nephew of Johann Benedict II., and son of Samuel Benedict; most famous and most important Biblical scholar of the Carpzov family. He was titular professor of Oriental languages at Leipsic 1719-30, and preacher and theologian till his death; like his uncle, he was an opponent of the pietists. His critical works are: "Introductio in Libros Vet. Test." 1721, 4th ed. 1757; "Critica Sacra" (I. Original text, II. Versions, III. Reply to Whiston), 1728; "Apparatus Historico-Criticus Antiquitatum et Codicis Sacri et Gentis Hebrææ," 1748. 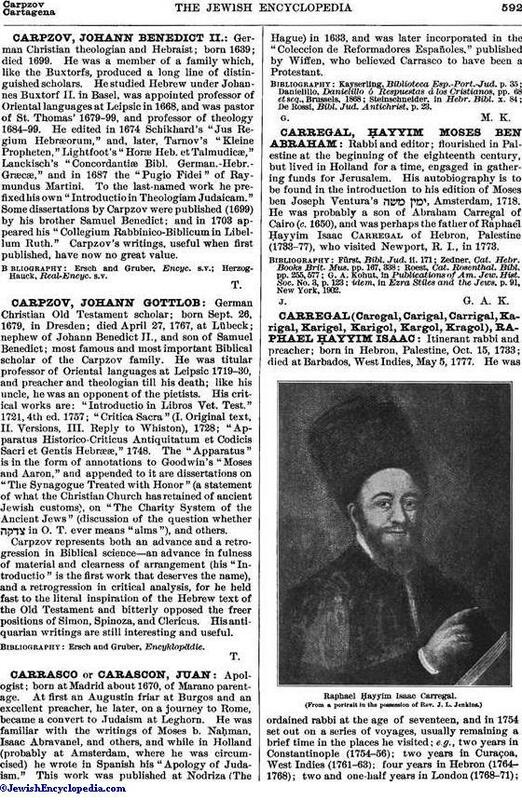 The "Apparatus" is in the form of annotations to Goodwin's "Moses and Aaron," and appended to it are dissertations on "The Synagogue Treated with Honor" (a statement of what the Christian Church has retained of ancient Jewish customs), on "The Charity System of the Ancient Jews" (discussion of the question whether in O. T. ever means "alms"), and others. Carpzov represents both an advance and a retrogression in Biblical science—an advance in fulness of material and clearness of arrangement (his "Introductio" is the first work that deserves the name), and a retrogression in critical analysis, for he held fast to the literal inspiration of the Hebrew text of the Old Testament and bitterly opposed the freer positions of Simon, Spinoza, and Clericus. His antiquarian writings are still interesting and useful.